Amazing but true: Second-century Gnosticism is a “big ticket” item today. TV feature programs, popular books and novels, and a flood of scholarly literature are discussing it. The recent unveiling of the thoroughly Gnostic Gospel of Judas caused quite a sensation, primarily because Judas is the “hero” of the story. Various groups and scholars have touted the spiritual wisdom of Gnostic movements and a few have even suggested that some Gnostic documents were unfairly prevented from entering the New Testament canon. The latest, complete, and authoritative translation of the major ancient Gnostic texts discovered in 1945 is entitled The Nag Hammadi Scriptures. Even though the authors nuance the term “Scriptures,” the book title makes an appeal to lay Christians that raises many questions and concerns. The current hoopla over ancient Christian Gnosticism has led to many misleading claims. It is vitally important for Christians to understand the Gnostic movements as accurately as possible, both for the sake of grasping the realities of the second-century church and for our own theological reflection. Gnosticism appealed to people then because it presented new, often creative, responses to the major questions of existence, buttressed by claims of secret, special revelation. In today's religious climate, suppressed literature offering an alternative to established orthodox tradition has an irresistible appeal. These old texts also seem to resonate with some people's spiritual quests. Because of the problem of how to label the Gnostics, some modern scholars argue that the term Gnosticism should no longer be used. They point out, correctly, that the movement was diverse, with many different sub-groups emphasizing different ideas. But other historians argue that, as long as this diversity is recognized, Gnosticism is still a legitimate generic term to talk about the family resemblances between these different groups (just as we use the terms “Christianity” or “evangelical”). The origins of Gnosticism are, like so much else we want to know about antiquity, shrouded in mystery and a subject of debate. Most Christians throughout history—and many today—have argued that the Gnostics were a heretical offshoot of the church in the second century. All the Gnostic writings we know of are from the second and third centuries A.D. However, there is substantial indirect evidence that the movement pre-dated Christianity (for example, an early tradition says that Simon Magus, mentioned in Acts 8, was the “father” of Gnosticism). It may have originated in Alexandria, Egypt, in the first century B.C. as an aberrant form of Judaism, combined with certain ideas about divine reality drawn from the Platonism of the time (which had developed beyond the philosophical ideas of Plato). This movement then found its “home” in early Christianity, understanding Jesus Christ as the true Revealer of the true God within the emerging Gnostic worldview. The evidence we have suggests that the Gnostic movements formed various, but related, schools of thought sometime slightly before A.D. 150. Earlier in the 20th century, some scholars (notably Walter Bauer) argued that in some places Gnostic Christians were the majority. It now seems clear, however, that Gnostics constituted a minority of Christians in the second century yet were strong enough to cause concern and alarm to various church fathers. Two very important second-century Gnostic leaders were Basilides and Valentinus. Basilides was a teacher in Alexandria, Egypt, before 150. According to the church fathers, he had been taught by Menander, who in turn had been taught by Simon Magus. Valentinus, who emerged in Alexandria and went to Rome around 140, was a brilliant Gnostic thinker. He wrote extensively and, according to Tertullian, was for a brief time a candidate for bishop of Rome. Some fragments of his writings have survived in short quotations in the church fathers. In addition to the schools of thought that formed around these two major teachers, other Gnostics focused special attention on the apostle Thomas (the famous Gospel of Thomas reflects this stream of thought) and others (called Sethians) focused on Seth as the “perfect” son of Adam and Eve and a Gnostic redeemer figure (sometimes subsumed under Christ). 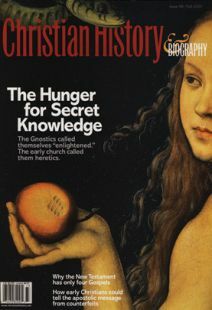 Prior to the discovery of the Nag Hammadi collection in the 1940s (see “The Secret is Out”), virtually all we knew about ancient Gnosticism came from the anti-Gnostic writings of the church fathers (which occasionally quoted a few Gnostic texts), a pagan Neoplatonic work against the Gnostics, and a couple of later Gnostic works, The Two Books of Jeu and Pistis Sophia. Today, we possess many more Gnostic books that give us a fairly reliable picture of how the Gnostics understood the world and salvation. Though there was great variety among the different streams of thought, there were a number of characteristic beliefs. All ancient Western cultures during the time of the early church were dualistic to some degree, due in part to the influence of Plato and his followers. Such dualism was so prevalent that the famous German scholar Hans Jonas once quipped that gnosis was the common bond of all religious cultures at that time. Gnostic dualism was distinguished by its absolute, radical character: All matter (the world and the body) is evil and has its source in an evil creator who fell from and betrayed the true God. This lesser, inferior divine being arose through some mysterious tragic split with the ultimate realm (the Pleroma or “fullness”) of the ultimate God, who is often called the Father of All. Some forms of Gnosticism believed that this split in the deity produced an extensive array of intermediary beings (archons, principalities, and powers, many of whom are given names like Yaldabaoth, Sakla[s], and Barbelo) who inhabit the cosmos between the Pleroma and the earthly realm. Gnostics believed that humanity is trapped in the material world/human body. The creator seeks to mislead humans by keeping them blind to the spiritual reality of the ultimate Father of All. In order to provide salvation, the ultimate God sent a redeemer, who navigated the journey from the Pleroma through the intermediary beings to earth. In some Gnostic texts this redeemer is Seth (drawing on the positive presentation in Genesis 4:25, 5:3, and 6:2-3), but the majority of Gnostic texts have Christ as the redeemer. Because the material world is evil, Christ only appeared to be human (this belief is called docetism and is condemned in 1 John 4:2). Gnostic books like The Second Treatise of the Great Seth therefore deny that Christ died on the cross. Christ provides salvation by delivering secret revelations/discourses to his true followers; it is this knowledge that is crucial. The saved are a special spiritual group of humanity (the Pneumatics) who “know” the folly of the material world/body and understand that in a “spiritual resurrection” they will be united with the Father of All. These “elect” have a divine spark (or spirit) of the ultimate God inside them, which is rescued through the secret revelations given by the redeemer. In many Gnostic texts, the salvation of the true spark is an ascent through the intermediary beings back to the Pleroma. Gnostics identified the evil god/creator with the God of the Old Testament; this had profound implications for their understanding of Scripture and the history of Israel. All Christians in the second century were struggling with their identity in relation to Judaism. For example, Justin Martyr, writing around 150, declared that the Jewish Scripture was actually a Christian book, since the Jews did not know how to understand it. And in 165, Melito, the bishop of Sardis, preached a Good Friday sermon on the death of Christ that accused the Jews of killing God. Gnostic interpretation of Scripture, therefore, often made the villains into heroes and the heroes into villains. For example, Eve and the serpent in the garden were the ones really in touch with the knowledge of the ultimate God; the inferior creator misled humanity. (In fact, some Gnostic groups were known as the Naassenes or Ophites, from the Hebrew and Greek words for “serpent.”) The 20th-century classics scholar Arthur Darby Nock once quipped that all one needed to do to create Gnosticism was to turn Genesis upside down and do inverse interpretation! In Gnostic texts, the recipients of “revelation” are usually various followers of Jesus (e.g., Thomas, Peter, Philip, John, Mary of Magdala). In the Gospel of Judas, the recipient is Judas, which comes as quite a surprise to readers of the canonical Gospels. Here it is Judas who delivers Jesus from his evil human body, thus achieving a major Gnostic goal. Just as with Eve and the serpent, a person who seems “evil” in the traditional texts is, in fact, the one in touch with the true Gnostic revelation. In the Gospel of Judas, the other disciples of Jesus are said to serve the lesser god, while Judas is open to the true God. Another implication of the Gnostics' asceticism and rejection of the body—and a subject of much modern debate—is their view of women. Gnostic texts are replete with sexual imagery, including feminine terms and images, yet they state over and over again the goal of sexual renunciation. The well-known Gospel of Thomas says, “For every female who makes herself male will enter heaven's kingdom.” This most likely means, in context, that renouncing worldly, physical existence is what prepares one for true salvation. Thus, male and female Gnostics are spiritual equals. Women seem to have had a prominent place in some Gnostic streams of thought. Mary of Magdala, for example, is a person of great significance in various Gnostic texts, such as the Gospel of Thomas and the Gospel of Philip. The Gospel of Philip states that the Savior loved Mary more than all of the other disciples and often kissed her. The Gospel of Mary presents Mary as the recipient of the Savior's true revelation, much to the disgust of Peter. These texts probably indicate some degree of Gnostic protest against the limitation of women's roles in the majority church, and they may suggest female leadership in at least some Gnostic circles. Yet many scholars are cautious; the texts we have do not clearly show that Gnostic movements were egalitarian or significantly dominated by female leaders. Because of their view of the physical world, it is unclear what role ritual practices played for Gnostics. Did they form churches? Did they celebrate the sacraments? We have very little evidence. But it does seem quite clear that many Gnostics embraced a set of sacramental rituals. For example, the Valentinian Gospel of Philip names five “mysteries”: baptism, chrism, eucharist, redemption, and bridal chamber. (There is a major debate among scholars about whether the bridal chamber refers to literal sexual activity; more likely it is symbolic, given the Gnostic rejection of the body.) The Testimony of Truth contrasts false baptism (that of the majority church leaders, perhaps?) with true baptism, which is the renunciation of the world. Although no text speaks of Gnostics “evangelizing,” their writings may have been used to attract followers, and Gnostic teachers certainly took the opportunity to speak with other Christians about their “misunderstandings.” Through whatever means, the movement grew. Many aspects of Gnosticism seem rather strange to us today. For example, in one Gnostic text, Jesus laughs during the crucifixion, because the person on the cross is only a material being created by the lesser god. Yet despite its “weirdness,” the early church fathers considered it a major threat to the church. How could such a movement have attracted any followers of Christ? What made Gnostic beliefs so appealing? Gnostics, like all other Christians in the second century, were attempting to answer the basic theological questions that confront human existence: What is the relationship between God and the created world? Why is there evil and how does that affect one's understanding of God? How should the Old Testament be interpreted in light of Christ? Who is Christ, and what is the salvation he offers? Given the spiritual realities of salvation, how should one regard the physical body? Is there a resurrection from the dead, and what does that mean? Gnostics were offering creative answers to these questions that many people found compelling and attractive. To many in the Greco-Roman world, Gnostic dualism may have seemed to provide very tidy solutions to thorny issues like the Incarnation. A person in that culture knew one thing for sure: The ultimate God would never be revealed in actual human form. Gnosticism was ultimately a “spiritual” movement. But to the majority of Christians, Gnostic answers about God, creation, and Christ were theologically inadequate. Gnostic groups remained strong through the second and third centuries, but then they began to lose ground significantly and by the fifth century were virtually extinct. Other issues such as Manichaeism (a derivative movement from Gnosticism) became the focus of debate, prompting the criticisms of Augustine of Hippo, for example. By this time, the church had gained the position and power to set and enforce the standards of orthodoxy.